With a significant 50’s Windrush era West Indian community, the St Paul’s riot in 1980 and it’s earlier history as a port central to the 18th Century transatlantic slave trade, Bristol has been something of a microcosm of the trials and tribulations of the black community in the UK. As such it’s hardly surprising that in the 70’s and beyond the city should have had a thriving reggae scene. 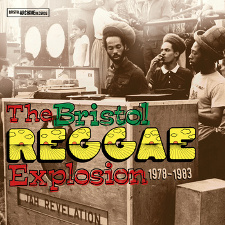 The Bristol Reggae Explosion 1978-83 from Bristol Archive Records, available for download now and on CD and LP in February of next year celebrates the bands and artists that in the face of some adversity produced some great and memorable reggae music. The biggest bands of the period, Talisman and Black Roots are well represented with three tracks each and the great Africa Is Our Land by Joshua Moses, is present and correct (which will save you Â£60-Â£100 on the cost of the original 12″ on ebay). Rescued from obscurity are a couple of solid 80’s roots tunes from Restiction and some lovers tracks by The Radicals, Sandra Bengamin and Buggs Durant. On the face of this release it’s hard to understand why a couple of the bands/artists represented didn’t go further, sign to bigger labels and release LP’s alongside the greats of UK reggae like Aswad and Steel Pulse. But even in the reggae world circa 1980 Bristol was Bristol and London was London, all to often the only recognition came on locally produced and self released limited run 7″ and 12″ singles. To Bristol Archive Recordings, though the style of music may differ from their usual punkier projects, the ethos of the DIY project by overlooked local musicians is their bread and butter, they’ve got a fine release on their hands here and hopefully this time round more of the music will reach a wider audience it always deserved.